Summer in Texas means it’s time to quell heatstroke with sweet, fruity ice. 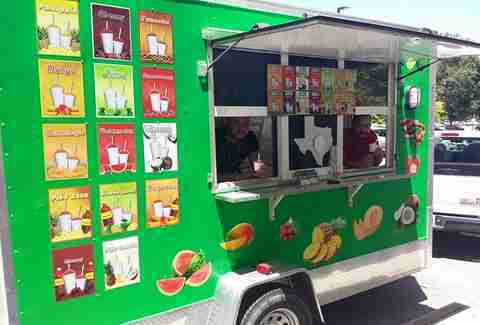 The rest of the country has sno cones or sno balls or whatever, but San Antonio has the real deal: raspas. 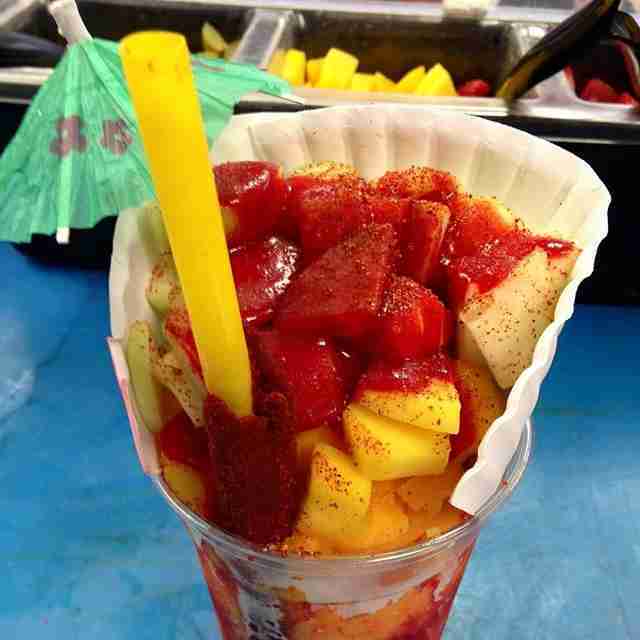 Here are the nine best raspa joints around. This watermelon raspa will transport you to another dimension where residents enjoy a cool northerly breeze and 410 traffic is nonexistent. Count your lucky stars as you bite into its fruity, creamy raspa-ness. Come back to reality when you’re done and order the Hot Cheetos with cheese, the most diabolical recipe in existence. Sure, these guys are new, but they know what it means to make a quality raspa. 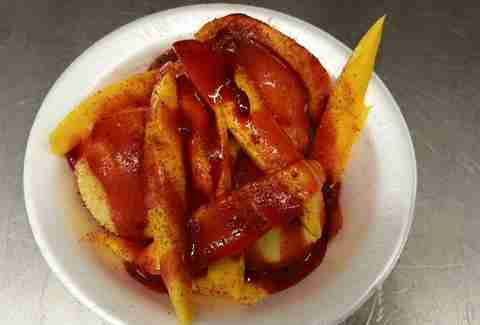 With outlandish presentations and fresh, never-from-a-jug citrus, Chamoy City Limits always refreshes us sun-toasted San Antonians. The Piccadilly Circus is not to be missed. 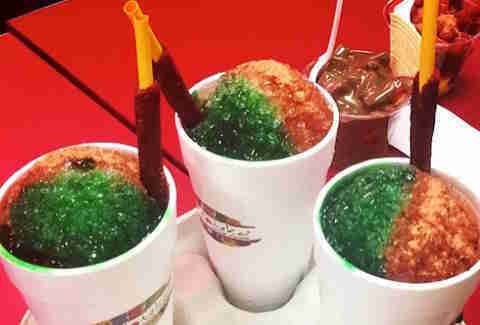 The ice comes piled high and drenched in cotton candy syrup, green chamoy, diced pickles, and secret salt. If that doesn’t sound like San Antonio then nothing does. 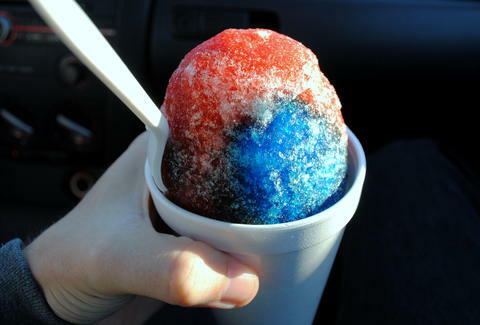 Big Daddy’s has the smoothest raspa in SA. The ice at this place has texture akin to a cumulus cloud -- light, fluffy and adorable. With the right in-house blends and condiments, a trip to this place is always a good decision. Pro tip: the Mangonada comes with massive fruit chunks so check off your daily fiber intake after a visit here. Don’t want to leave your house because it’s 150 degrees outside? Don’t worry -- Frozen Fridays delivers because they love you. 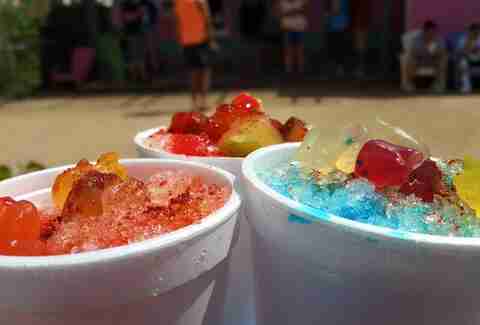 They love you so much they’re willing to risk heat stroke just so you can enjoy a delicious puro raspa. 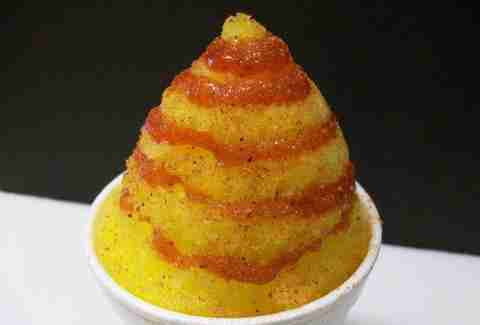 Also, just know there’s a raspa named after SpongeBob SquarePants served in a real pineapple. What Sam’s does to its raspas is a mystery. The watermelon with extra Lucas tastes like a summer beach house in a good way. 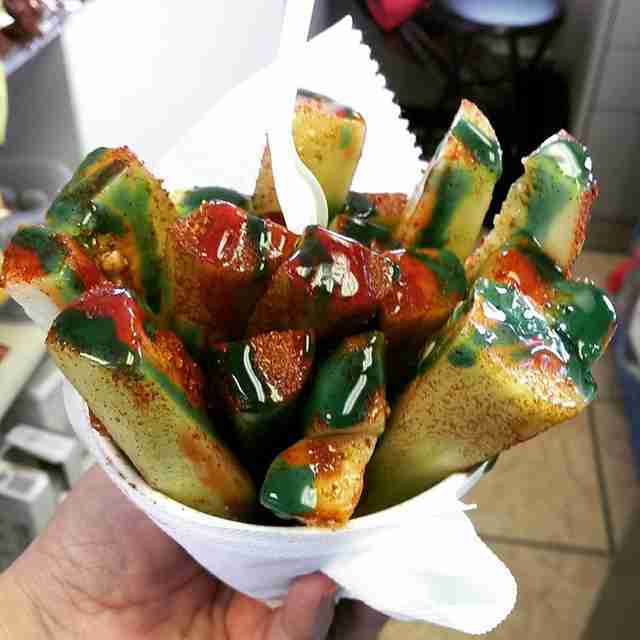 Its raspas define San Antonio summer and without a visit to this joint, it might be impossible to call yourself a San Antonian. If the watermelon flavor doesn’t cut it, try lemon-lime -- it will refresh and please your innermost puro desires. Some of the best frozen treats SA has to offer + movies in the parking lot = A++ summertime experience. Snowcone Addiction is aptly named -- most of its customers crave its Gorilla Drank, but its simple recipes are where it really shines. 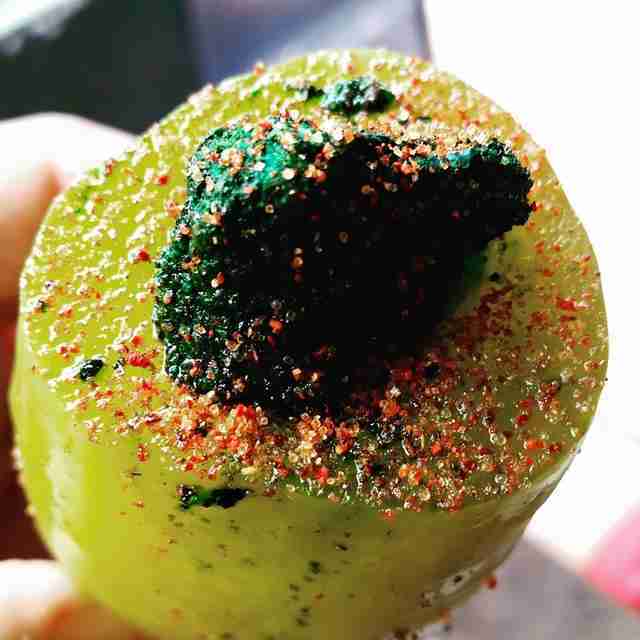 The Pickle Juice raspa won’t over power and the Jolly Rancher Green is the perfect balance of sweet and ice cold. Snow Monkey doesn’t use crushed or shaved ice -- its machine pumps straight-up snow. The ice sticks together softly, allowing your spoon to enter and exit without total raspa annihilation. Our only complaint about the Mojito raspa at Snow Monkey is its lack of real rum. Pro tip: take it home and do what you wish with it. Not to be confused with the colorful button-shaped chocolates or Marshall Mathers, M & M’s serves up serious raspas. In addition to fruity, refreshing, and icy raspas, the joint serves some of the best fried food south of the state fair. If you have a stomach lined with steel, try the fried Oreo kabob, but if you’re intestinal track is more discerning, give the fried pickles a shot. Chocolateka is mainly a chocolate joint, but it doesn’t matter -- its raspas get the job done. Upon entering, you’ll be greeted by three giant, flowing chocolate fountains. These are fine in winter, but pay no mind to them for now. 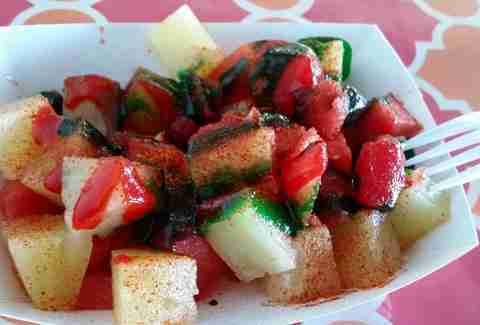 Order a chamoy raspa instead, sit at a table near the A/C vent, and feel your body temperature decrease to a livable level.